Last month I wanted to refresh my blogroll. Among the additions one blog stands out because its name does not start with a letter, but with a number, and it appears now as the very first item of the blogroll, reason enough for further exploration. It is a project for a new edition of laws created by a king with perhaps the best reputation of all medieval kings, at least in modern perception. Alfonso el Sabio, or Alfonso X of Castile, king Alphonso the Wise, wrote the songs of the Cantigas de Santa Maria, and he created a famous law collection, the Siete Partidas (Seven Parts). For a new critical edition of this collection the Spanish team of editors have created the blog 7 Partidas Digital: Edición critica de las Siete Partidas, hosted by the Hypotheses network. In this post I will look at this project and I will try to provide some context for it. Royal legislation in the Middle Ages is not easy to bring under one common denominator. Scholars such as Sten Gagnér (1921-2000) have helped us much to see legislation in new light, in particular in his Studien zur Ideengeschichte der Gesetzgebung (Stockholm, etc., 1960). Armin Wolf focuses in his research on medieval legislation, in particular in Gesetzgebung in Europa 1100–1500: Zur Entstehung der Territorialstaaten (2nd edition, Munich 1996), and like Gagnér he has written about a great variety of laws and lawgivers, including Alfonso el Sabio (1221-1284). In 2002 the Max-Planck-Institut for European Legal History in Frankfurt am Main could acquire the vast library of Gagnér. Michael Stolleis, for many years the director of this institute and a scholar trained by Gagnér, wrote a moving and most instructive tribute to Gagnér [‘Sten Gagnér (1921-2000), ein großer Lehrer der europäischen Rechtsgeschichte’, Quaderni Fiorentini 29 (2000) 560-569; PDF]. For many years Wolf, too, worked for and at this institute. His fundamental book about medieval legislation first appeared in a volume of Helmut Coing’s Handbuch der europäischen Privatrechtsgeschichte. It is by all means wise to benefit here, too, from the rich resources of this Max-Planck-Institut, starting perhaps with the online catalogue of its library. Let’s start a tour of the blog 7Partidas Digital, a project at the Universidad de Valladolid. There have been two major adaptations of this legal collection, in the incunabula edition of 1491 (Alonso Díaz de Montalvo) and the edition published in 1555 (Gregorio López), and a semi-official edition in 1807 by the Real Academia de la Historia, but not yet a critical edition. The aim of the project is to bring together all textual sources and present them online, to create an online critical edition and to provide a up-to-date bibliography of relevant scholarship in a Zotero group. The bibliography takes as its starting point the study of Jerry Craddock, The legislative work of Alfonso X. A critical bibliography (London 1986; 2nd edition, 2011). You can consult the 1986-1990 update of Craddock’s bibliography online (eScholarship, University of California). Already the fact that Craddock could adduce manuscripts not earlier included and comment on them should make you aware of the complicated textual tradition of the Siete Partidas and other Alphonsine laws. By the way, Robert Burns added an introduction to the reprint of the English translation of the Siete Partidas by S.P. Scott (first edition 1931; reprint 5 vol., Philadelphia, 2001, 2012). The core of the project is the online edition hosted at GitHub which is being created using XML / TEI. TEI stands for Text Encoding Initiative, one of the major metadata standards in creating digital text editions. As for now the project has resulted in editions of some textual witnesses kept at Valladolid. The Siete Partidas is a rather large legal code. The section Léxico explains the incunabula edition in 1491 contains 772,000 words. The first part (Primera partida a.k.a. Libro de los leyes) in one particular manuscript (London, British Library, Add. 20787, sigle LBL) good for more than 165,000 words. The image of a kind of Spanish armada, a fleet with an outsize flagship and many minor vessels around it, is probably a fair description. The project will create a special dictionary for the Siete Partidas, of which the letter Z, the only one already published, gives you an idea. The section Testimonios gives you a general overview of relevant manuscripts and their contents, mainly as noted in the Philobiblon project for Iberian medieval manuscripts (Bancroft Library, University of California at Berkeley), and for a number of them – including LBL mentioned above – extensive descriptions. One of the scholars helping to track down manuscripts with laws issued by Alfonso el Sabio was the late Antonio García y García. A further asset on this web page is an interactive map showing where institutions have relevant manuscripts within their collections. An essential element in this project are the Normas de codificación, the rules for the encoding of the text and the critical apparatus in the XML / TEI pages, and additional guidelines for the transcription of the legal texts. By now you might think all this information does not yet bring you directly to the texts associated with king Alfonso el Sabio, but you could as well admit that some preparation is needed indeed to approach them. I had expected to find here both images of manuscripts and an edition on your computer screen, and therefore I would like to provide you at least with some information about the most important printed editions. A text of the Sieta Partidas was printed twice in 1491 [Las siete partidas de Alfonso X el Sabio, con las adiciones de Alfonso Díaz de Montalvo (Seville: Meinardus Ungut and Stanislaus Polonus, 25 October 1491; GW M42026, online for example in the Biblioteca Digital Hispánica)], and two months later again with the same title [(Seville: Compañeros alemanes, 24 December 1491) GW M42028, online in the Biblioteca Virtual del Patrimonio Bibliográfico (BVPB)]. The Gesamtkatolog der Wiegendrucke (GW) (Staatsbibliothek zu Berlin) and the Incunabula Short Title Catalogue (British Library and CERL) show you concise bibliographical information and lists with extant copies worldwide, for both editions rather short lists. 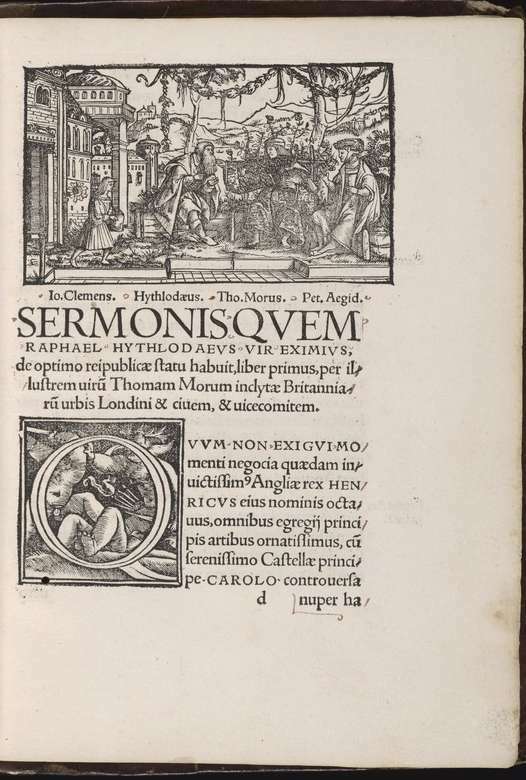 The edition by Gregorio de López de Tovar appeared in 1555 and can be viewed online in the BVPB [Las Siete Partidas del Sabio Rey don Alonso el nono (…) (Salamanca: Andrea de Portonariis, 1555)]. The Biblioteca Digital Hispánica brings you not only a number of old reprints, some of them enhanced with useful registers, but also a number of digitized manuscripts. It contains also a digital version of the edition published by the Real Academia de la Historia (Las Siete Partidas del Rey Don Alfonso el Sabio cotejada con varios códices antiguos (…) (Madrid 1807)]. The Hispanic Seminary provides you in its Digital Library of Old Spanish texts in the section for Spanish legal texts with a transcription of the Primera Partida in the 1491 edition. You can find more editions and books about the Siete Partidas in the Catálogo Colectivo del Patrimonio Bibliográfico Español, and for example in the Bibliografía Española en Línea, a service of the Biblioteca Nacional de España, and more specifically in the Repertorio del Medievalismo Hispánico (Institución Milà y Fontanals, Barcelona). In the midst of all these elements I would almost forget to mention the blog posts of Siete Partidas Digital, to be found under Entradas. The most recent contribution in this second is a full-scale article by José Domingues (Porto) about the Portuguese version of the Siete Partidas and its manuscript tradition (A Tradição Medieval das Sete Partidas em Portugal). The first blog post alerts to the 2015 revised online version of Dwayne E. Carpenter, Alfonso X and the Jews: An Edition of and Commentary on Siete Partidas 7.24 «De los judios» (thesis, University of California, 1986), and to new textual witnesses found in the Archivo de la Real Chancillería de Valladolid, referred to in the edition with the sigle VA4, but alas the links to the finding aid with these archival records and to the article describing them are broken. However, here the project in Valladolid scores with its section on text bearers: The page on VA4 gives you full information, but here, too, you have to reckon with links to Spanish archival records which stem from expired web sessions. You will have to repeat yourself each consecutive step of the search at the rich but cumbersome navigable PARES portal, the digital home to both online inventories and many digitized archival records in Spanish state archives. You will find a quick introduction to Alfonso el Sabio and the texts concerning the legal status of religious minorities in the Siete Partidas in the database of the RELMIN project around the position of these minorities in the medieval Mediterranean, with also some references to basic modern literature, and for each of the relevant texts a translation, an analysis and references to further studies. RELMIN provides you with sometimes both English and French translations. Normally I would feel rather exhausted, or to be honest definitely feel irritated, to say the least, about such a sorry state of affairs, the combination of a broken link and arduous recovering information using the PARES portal, but this time I can appreciate very much one of the things Sten Gagnér taught his students, not only in his lectures and seminars, but foremost by his own example. At the end of this post I really want to mention something Michael Stolleis made crystal clear in his tribute to Gagnér. He wanted his students to see things for himself in sources, to trace back and check the steps others had set, be they the pioneers and leaders in the various fields of legal history or more average scholars, to see the very words in the sources they found, to assess the meaning and context of words anew. Studying legislation in past and present in all its forms should be an exercise in good thinking, not a slipshod affair, as if you only have to dip your spoon in an ocean of sources. No school, department or faculty can provide you completely with his kind of training, because here your own intellectual honesty and drive to become and be a true historian should work for all you are worth, for all things and people you value most. After the things I said about the PARES portal I must do justice to the riches of this portal by referring to the wonderful online guide by Scott Cave and Ashleigh Dean, aptly called Taming PARES. Their guide really unlocks this treasure trove! The Casa Velasquez in Madrid will host from November 2 to 4, 2017 the conference Las Siete Partidas: une codification nomrative pour un nouveau monde. This entry was posted in Digital editions, Manuscripts, Scholars and tagged Bibliography, Digital humanities, Early printed books, Legal history, Manuscripts, Medieval law, Public law, Spain on June 13, 2017 by rechtsgeschiedenis. Medieval literature sometimes touches law and justice, and thus it can be useful to look sometimes beyond the usual range of sources and materials legal historians prefer to study. The Biennial London Chaucer Conference will devote this year’s conference on June 30 and July 1, 2017 to Chaucer and the Law. At least three stories in the Canterbury Tales have lawyers or other persons associated with the law in its title, the sergeant-at-law in the tale of The Man of Law, the manciple and the summoner. Legal professions come into view in some of the other tales, too. The summoner had been attacked in The Friar’s Tale, to mention just one example. This post looks briefly at the upcoming conference, but I will not hesitate to add some personal remarks, too. A few months ago I came across a blog post by Candace Barrington, ‘Beyond the Anglophone Inner Circle of Chaucer Studies’ at In the Medieval Middle, and I could only agree with her about the importance of Chaucer to wider circles. The programme of the upcoming conference seems a major step in bringing him in a different context. Here I try to come closer to the field of literature than I do here usually. The conference in London is organized at Senate House by the Institute of English Studies at the School for Advanced Studies, in cooperation with the New Chaucer Society and the Society for the Study of Medieval Languages and Literature. Senate House is home to the Senate House Library. If you come more or less from the outside to Chaucer it can really seem you enter a kind of parallel universe. When you spot at the website of the New Chaucer Society the link to the Chaucer Bibliography Online (Mark Allen, University of Texas at San Antonio) the sheer mass of studies about a plethora of subjects is awe-inspiring. With only the search term law you will retrieve more than 400 results. Chaucer definitely is treated as a part of world literature, but Barrington makes it clear it that only lately studying Chaucer has become a worldwide activity which can break though the lines of approach practised in the Anglophone world. Barrington is one of the founders of Global Chaucers, created as the “Online archive and community for post-1945, non-Anglophone Chauceriana”. The resources page of this blog shows you the wide impact of Chaucer and leads you also to a list of modern translations. The social media, too, have a role in creating a wider circle of people delving into Chaucer’s work. Many years ago the House of Fame, a blog maintained by a modern incarnation of Chaucer, was launched. Meanwhile this modern Chaucer has become a master of funny Middle English tweets by Le VostreGC. For Chaucer and the Law there is the Twitter account Chaucer_Law. I will not give a here a complete guide to Chaucer studies, but some websites can help you very much. Among the short introductions to Chaucer the online exhibit The World of Chaucer. Medieval Books and Manuscripts (Special Collections, Glasgow University Library) is helpful. The University of Sheffield has created a portal for critical editions of the Canterbury Tales where you can easily compare some of the main manuscripts containing this work, including the Hengwrt and Ellesmere manuscripts. eChaucer: Chaucer in the Twenty-First Century (University of Maine at Machias) is a portal with both the original texts and translations, and a concise web guide. Candace Barrington contributes also to an open access companion to the Canterbury Tales. 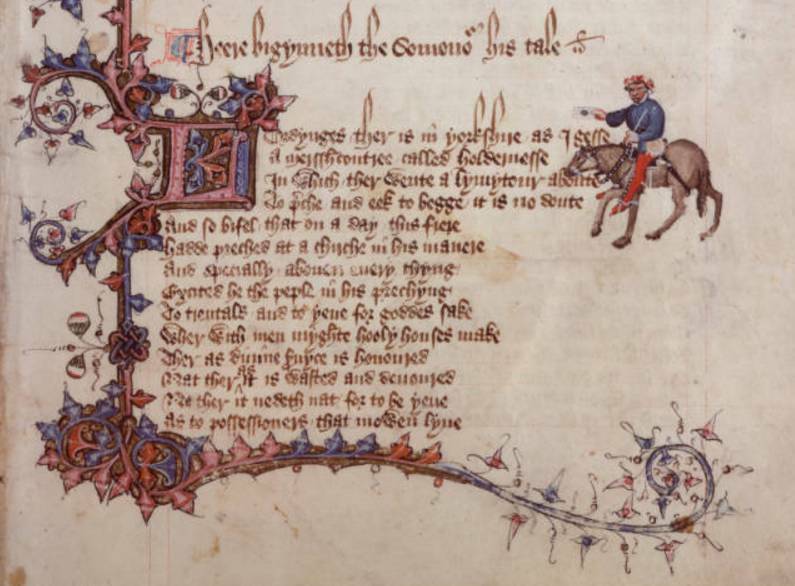 Siân Echard (University of British Columbia) provides a great service with his web pages on Chaucer: Manuscripts and Books on the Web, but for the image of the Ellesmere manuscript shown here I preferred to visit the website of the Huntington Library. Visualizing Chaucer (University of Rochester, NY) is your online port of call for more images of and around Chaucer. If you hesitate about the importance of images you might want to look at The Robin Hood Project of the Robbins Library of the University of Rochester. The programme of the two-day conference in London shows a wide variety of sessions. With a sigh of relief I saw the first section is dedicated to A Preface for Chaucerians: Chaucer for Historians, a promise that Chaucer will not be only the subject of literary views. Anthony Musson will discuss the sergeant-at-law, the teller of the Man of Law’s Tale, and Nigel Ramsay will speak about the manciple and his tale. A quick view of the programme shows also that the Canterbury Tales are not the exclusive source linking all contributions. Chaucer’s other works figure here as well. It is about time to confess I, too, look at Chaucer from a foreign perspective. My knowledge of English legal history, too, is refreshed and even extended here., and anyway it is simply necessary to tell something more about the three main figures associated with the law in the Canterbury Tales. The sergeants-at-law were for centuries barristers with the exclusive right to argue cases in the Court of Common Pleas. A manciple was a purveyor of goods for a court or college, sometimes a caterer of food. The summoner was an official in ecclesiastical courts who delivered charges to people compelling to appear in court. Peter Guy Brown will discuss this official in his paper. Let’s not forget to look briefly at Chaucer himself. Geoffrey Chaucer (around 1343-1400) was a public servant with functions such as a valet de chambre to king Edward III, customs official for the port of London and deputy forester in Somerset. He acted as a royal envoy in France and Italy. In 1386 he became a Member of Parliament. As a poet-diplomat he must have met all kinds of people, and these meetings are in a way mirrored in the figures portrayed in the Canterbury Tales and in his other works. He is a master at playing with reputations and stereotypes. Of course it will not do to plod here through all papers of the upcoming conference in London, you will find here a personal choice. Some papers refer to other kinds of law as well. Samantha Katz Seal will look at laws of lineage in Chaucer’s work. Julie Chamberlin will discuss legal networks in The Franklin’s Tale. Chaucer’s Complaint unto Pity is the subject of Jonathan Forbes’ paper in which the complaint will be compared to a legal plea. Claire Fennell will discuss a Middle English statute book in the manuscript Oxford, Bodleian Library, Rawlinson MS B 520. The first day ends with a plenary lecture by Emily Steiner on medieval literature and the limits of law. The second day will start with a contribution from Groningen. Sebastian Sobecki will give a plenary lecture about Chaucer’s lawyers. Sobecki prepares with Barrington The Cambridge Companion to Medieval Law and Literature. Recently he published Unwritten Verities. The Making of England’s Vernacular Legal Culture, 1463–1549 (Notre Dame, IN, 2015). Arvind Thomas will speak about literature and legal maxims. Euan C. Roger will look at Chaucer’s career in royal service by looking at the plea rolls. Among other themes to be addressed are sumptuary laws, the role of conscience, freedom of speech, treason and mercy. Part of the attraction of Chaucer’s Canterbury Tales is his skill in picturing people by their conscious or unconscious use of particular language. In many tales he succeeds in disguising the origin of a story. The fragmentary tradition and the signs alluding to a possibly different ordering and sequence of the tales provide space to use widely different perspectives to gain insights. Every tale in the Canterbury Tales forms a kind of microcosmos with a multitude of aspects, and on the other hand they are part of a network of tales. Being aware of the very variety of medieval life, culture and society is not a bad thing when studying medieval law and justice, and Chaucer offers a focus for looking at the fourteenth century. This entry was posted in Manuscripts, Scholarly events and tagged Common law, Illuminated manuscripts, Legal history, Literature, Medieval law, United Kingdom on May 27, 2017 by rechtsgeschiedenis.